The majestic Cathedral Basilica in Covington. St. Mary’s Cathedral Basilica of the Assumption, or simply, “The Basilica” rises above Madison Avenue, its golden brilliance silhouetted against the darkness and lending a little bit of old-world grace to the pawn shops, bars and auto parts stores of the gritty streets. Tired people shuffle toward the western corners of Twelfth and Madison across the street from the enormous church, their eyes coming to rest on its exquisite loveliness before continuing on their way. At night, the Basilica can make you forget you are standing in front of a Walgreens or an army supply store in Covington, Kentucky. An obvious question is “Why is this beautiful church a cathedral basilica instead of a regular cathedral?” According to the church’s website, http://www.covcathedral.com/, the difference between a cathedral and a basilica is one of dignity, antiquity, historical significance or importance to the diocese. In the case of St. Mary’s, all of these are true. Interior of the Cathedral Basilica looking toward the altar. The dignity is hard to miss. It is 81 feet tall and 180 feet long. It was built in the Thirteenth Century French Gothic style of architecture that was popular during the middle ages. The exterior is a one-third size replica of Notre Dame Cathedral in Paris, France (not Paris, Kentucky)! 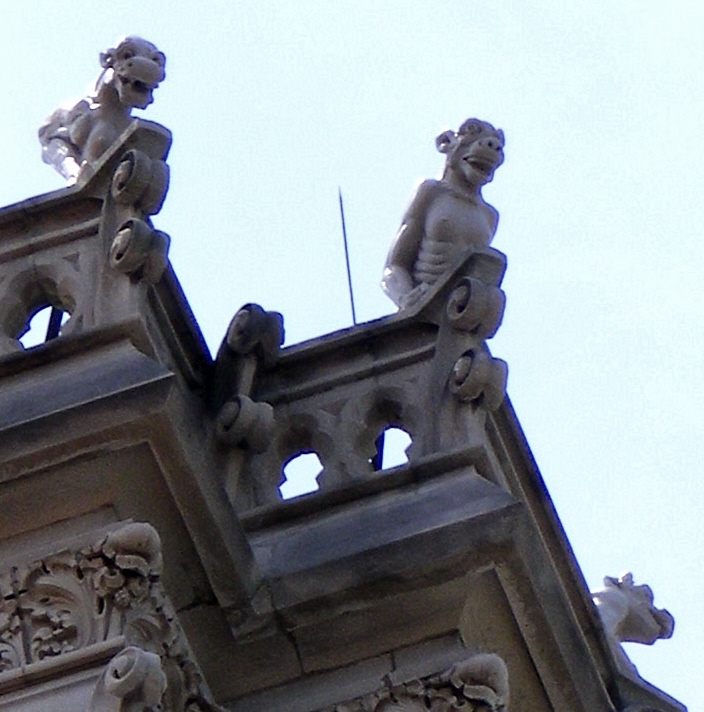 Twenty-six Italian-carved gargoyles, or glorified gutters, divert rainwater and protect the church from evil spirits. The gargoyles, which look like tortured animals with human bodies, represent humans who are suffering under the burden of sin. The interior of the church is modeled on the Abbey Church of St. Denis in Paris, where Marie Antoinette, among others, is buried in a crypt. The sanctuary is 54 feet long and 37 feet wide. The slender columns of Indiana limestone stand 26 feet tall and support the delicate triforium and clerestory levels. The arches and vaults used in Gothic cathedrals have a higher and narrower confluence, or centerpoint, than Romanesque arches, which have a rounder appearance. 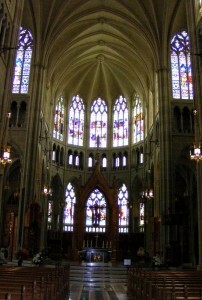 The gothic arches give the interior a vast, soaring atmosphere. The arches distribute the weight of the heavy stone and transfer it to the ground through a series of ribbed, or groin vaults, which are made of two intersecting arches. Gargoyles atop the Cathedral Basilica. A basilica can be major or minor. There are only four major basilicas in the world, and they are all in Rome. On December 8, 1953, Pope Pius XII gave St. Mary’s the distinction of a minor basilica at a Solemn Pontifical High Mass, which was celebrated by the Most Reverend William T. Mulloy, D.D. The Covington basilica is one of only 35 minor basilicas in the United States. The St. Mary’s parish in Covington has an interesting history. The first Catholic church in Covington, St. Mary’s has had as its home a church, a cathedral, and finally a basilica. The current church on Madison Avenue is the third home of the St. Mary’s parish. The first church opened in 1837, and by 1851 the parish had outgrown it. By 1868, the parish had again outgrown their church, this one on Eighth Street between Greenup and Scott streets, which was designated as a cathedral – the bishop’s church. There was a lack of adequate funding until 1885, when the Most Reverend Camillus Paul Maes, the Third Bishop of the Diocese of Covington, began planning the Cathedral. He purchased the Delaney and McVeigh lots at the northeast corner of Twelfth and Madison for the church, as that point was considered the center of Covington at the time. By late 1893, plans were finalized between Bishop Maes and architect Leon Coquard, subscriptions to help finance the construction were purchased, and on April 13, 1894, ground was broken. On September 8, 1895, Bishop Maes placed the cornerstone, and by September of 1897 the vaults, columns and walls of the crucifix-shaped shell of the nave, transept and apse were complete. By January 1901, money had run out, so a plain brick wall, rather than an elaborate façade, was constructed to temporarily seal off the church from the elements, and plain glass windows, glazed to remove the glare, were placed in lieu of stained glass. On January 27 of that year, Bishop Maes dedicated his church. 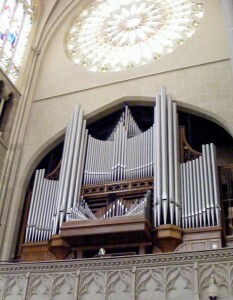 The main organ, one of three, in the Cathedral Basilica. By 1908, funds had been raised to complete the façade and the stained glass windows, which were finished by 1910. Bishop Maes concentrated on the interior until he died in 1915, and Bishop Brossart continued his efforts. He worked with world renowned Covington artist Frank Duvenek, who painted large murals for the walls of the Blessed Sacrament Chapel. Eighty-two stained glass windows, made in Munich, Germany, adorn the church. 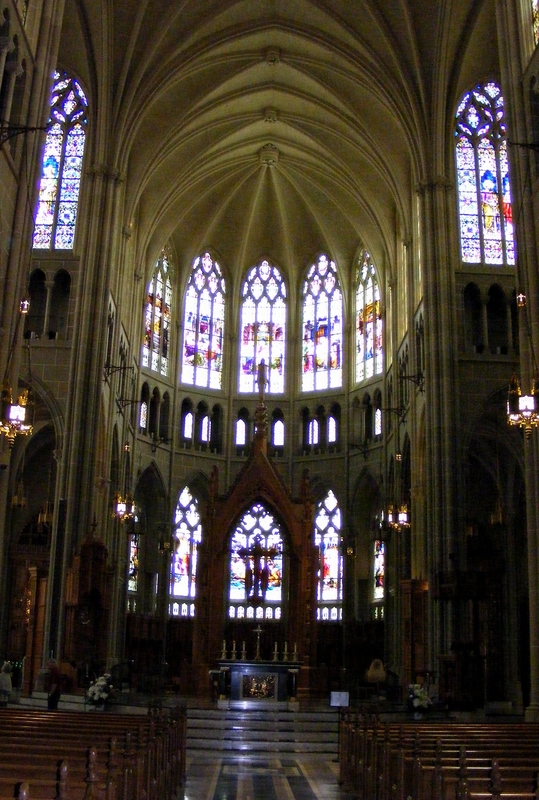 The north transept window is the world’s largest stained glass window in a church, measuring 67 feet by 24 and representing the Ecumenical Council of Ephesus. Two 26-foot rose windows, on the rear of the church and the south transept, picture a papal tiara and the Alpha and Omega symbols. Windows behind the altar represent the miracles of Christ. The spiritual symbolism turns comical in one stained glass window that features a disciple with eyeglasses. In 1946 the interior was renovated. The antique verde marble floor, the altar, and the baldachino, or canopy over the altar, was installed. Carved of Appalachian Oak, it represents 16 saints. Like the rest of the church, the area surrounding the pulpit is full of symbolism; the carvings of preachers illustrate the theme of teaching, and the Cathedra, or bishop’s chair, symbolizes the Bishop’s teaching authority. Each Station of the Cross in the Cathedral Basilica is a mosaic consisting of as many as 80,000 tiles. There are four shrines in the church. The canopaeum and tintinnabulum near the St. Joseph Shrine are a testament to the Cathedral’s status as a basilica. The elegant baptistery was carved from one piece of limestone. 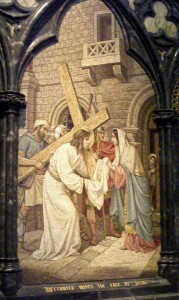 The mosaic work of the Stations of the Cross contain up to 80,000 tiles, which were made in Venice, Italy. The historic Matthias Schwab Organ (1859) at the rear of the church was carried pipe-by-pipe two blocks from the church of Old St. Joseph on Twelfth and Greenup streets in 1975 when that parish combined with St. Mary’s. Old St. Joe’s was demolished, but a great tradition of concerts was begun and still continues today. Three organs, the pipe organ in the south transept balcony, a smaller Wicks organ and the Schwab organ, amount to 83 ranks. When the three organs are played together, there are 4576 pipes echoing through the lofty cathedral. The Cathedral Concert Series features concert organists from all over the world, as well as orchestras, brass quintets, and choirs, in performances of classical and western liturgical compositions by Bach, Haydn, and other composers of classical western sacred music by musicians from the University of Cincinnati College Conservatory of Music, Northern Kentucky University, Queen City Brass and various individuals and musical groups, including the May Festival and the Vocal Arts Ensemble. The series is in its 34th season. The concerts, which are free to the public, are held monthly on Sunday afternoons, October through April. A schedule is available at www.home.fuse.net/timbrel. 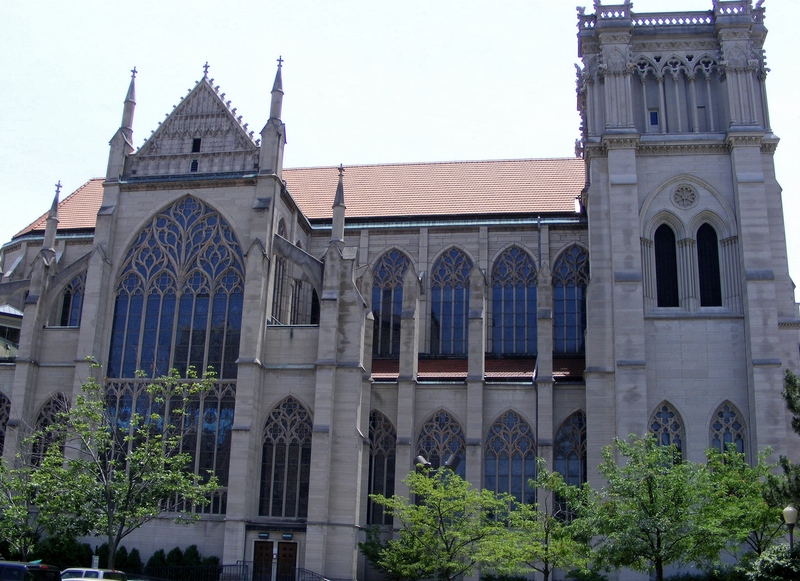 Though the Basilica owes its name to its significance in the Catholic community, the church is embraced by non-Catholic Covingtonians, Cincinnatians, and tourists as an architectural masterpiece and historic treasure. The recent restoration won the 2002 Preservation Award from Cincinnati Preservation Association. The Basilica has 70,000 visitors each year, and with good reason – the church is breathtakingly beautiful inside and out. The Cathedral Gardens in the area of the south transept and sacristy were designed by landscape architect John Bentley. A Peace Pole, a symbol of universal peace, which was given to the Cathedral by the Peace and Justice Center and dedicated on the anniversary of the Hiroshima destruction, extends the Sign of Peace, one of my favorite parts of the Mass, to everyone. The Cathedral is open for self-guided tours Monday through Saturday from 9 a.m. to 4 p.m. Free brochures are available at the greeter’s desk in Spanish, German, Russian, French and Japanese. Guided tours for groups of 10 or more can be arranged by calling two weeks in advance (859-431-2060.17).